The Anchorage Restaurant and Cocktail Bar is located on-site. It is open for breakfast, lunch and dinner with a selection of locally caught seafood on the menu. This property is 8 minutes walk from the beach. 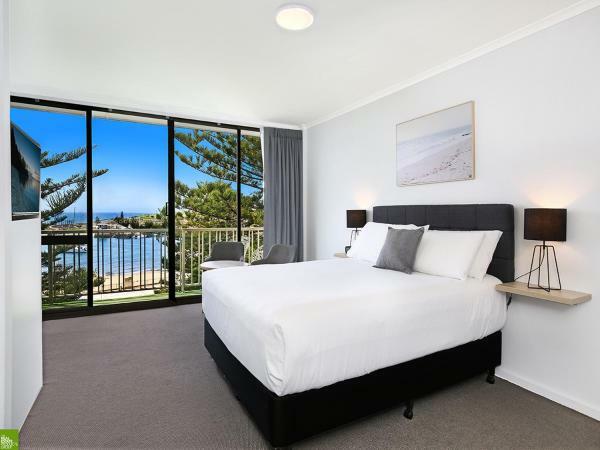 Boat Harbour Motel is located opposite Wollongong Harbour and is just 3 minutes’ walk to the . All rooms have a private bathroom and either ocean or city views. Guest facilities at Motel Boat Harbour include , plus a dry cleaning and laundry . The rooms feature air conditioning and tea/coffee making facilities. Wireless internet access is available at a cost. Interconnecting rooms are also available. The Boat Harbour Motel is situated opposite the city’s main cycleway and is only 10 minutes’ walk to . Nightly rates from $102 to $123. This air-conditioned room features a private balcony with city views. It also has satellite TV, free Wi-Fi, and a kitchenette with a microwave, refrigerator and tea and coffee maker. Please note that the price is based on 2 guests. Maximum occupancy is 3 (see Hotel Policies). Room facilities: Tea/Coffee Maker, Shower, TV, Telephone, Air conditioning, Hairdryer, Wake Up Service/Alarm Clock, Iron, Kitchenette, Balcony, Radio, Refrigerator, Ironing Facilities, Seating Area, Toilet, Microwave, Bathroom, Heating, Satellite Channels, Cable Channels, Carpeted, Alarm clock, City view Can you tell us what you'd like to see here? This air-conditioned room features a private balcony. It also has satellite TV, free Wi-Fi, and a kitchenette with a microwave, refrigerator and tea and coffee maker. This room has no capacity for additional guests. Room facilities: Tea/Coffee Maker, Shower, TV, Telephone, Air conditioning, Hairdryer, Wake Up Service/Alarm Clock, Iron, Kitchenette, Balcony, Radio, Refrigerator, Ironing Facilities, Seating Area, Toilet, Microwave, Bathroom, Heating, Satellite Channels, Cable Channels, Carpeted, Alarm clock Can you tell us what you'd like to see here? This air-conditioned room features a private balcony with ocean views. It also has satellite TV, free Wi-Fi and a kitchenette with a microwave, refrigerator and tea and coffee maker. Room facilities: Tea/Coffee Maker, Shower, TV, Telephone, Air conditioning, Hairdryer, Wake Up Service/Alarm Clock, Iron, Kitchenette, Balcony, Radio, Refrigerator, Ironing Facilities, Seating Area, Toilet, Microwave, Bathroom, Heating, Satellite Channels, Cable Channels, Carpeted, Alarm clock, Sea view Can you tell us what you'd like to see here? This single room features a microwave, air conditioning and sea view. Room facilities: Shower, TV, Telephone, Air conditioning, Hairdryer, Iron, Kitchenette, Balcony, Radio, Refrigerator, Ironing Facilities, Seating Area, Toilet, Microwave, Bathroom, Heating, Satellite Channels, Cable Channels, Carpeted, Alarm clock, Toaster, Sea view Can you tell us what you'd like to see here? Nice and clean hotel with partial views over the harbour. Just a bit dated. Book the ocean views room. Great outlook. This motel is very reasonably priced and ok the interior is a bit dated but it's clean and the view is brilliant from the ocean views rooms and the location is great. I have already booked my next long weekend here. My friend & I had 2 rooms 1 night stay. A fellow guest finally got new TV working, no luck with phone st all. Room v clean. Top views of ocean etc. Anchorage rest lovely coffee, food not expensive! Motel could do some TLC now. Jr. Comfortable reasonably sized rooms, with kitchenette and private balcony. We very much enjoyed our stay. This is a very well kept no-frills motel. We just needed a stop over place so I didn't look for anything fancy — and I didn't expect any bells and whistles here. However, the building itself is quite a lovely set up — with the centre of the motel open with a tropical garden with tables and chairs in the middle, and a lovely shell water fountain. The other surprising thing was the restaurant. We saw photos promoting the food placed inside the elevator — and to be honest, they looked so good I thought they were stock photos. Shame on me! The restaurant is not only lovely itself, but the food is great! We really enjoyed our short stay here — I highly recommend this place. Excellent value for money. Great service by very friendly staff great location. Fantastic menu with a lovely presentation of the meal. The service outstanding. A very happy lunch had by all. Love staying here. It is in a great location. The beds are comfortable and the staff are great. It is a great place to relax and unwind with family. The price is great for the location and comfort. Pros : Very good restaurant. Wonderful staff all around. Good location within short walk to the beach and playground for children as well as cafés, restaurants and into town for other dinning options. Clean fresh sheets. Cons : Worn out rooms and facilities. Noisy traffic on the road (would apply for any resort along the beach I imagine). Parking is under supplied as the combined restaurant and guest totals mean you may end up parking a block or two over out on the street. Being a motel ones expectations should naturally be lower than that of a hotel. The being said the friendly and helpful staff take care of the motel compensate for the locations short commings. I requested and was given an ocean facing room with the hope of being able to hear the ocean at night however it is not possible due to the location being closer to the harbour bay (hence the name) which shelters it from the waves. This is a personal reflection and not an issue with anything the motel claimed to offer. However should you be like myself and enjoy going to sleep to the sound of the ocean you will be disappointed. Our room only had one towel in the bathroom when we arrived and we simply had to let them know at the desk and it was corrected immediately and then housekeeping staff came by again later with another set just to be sure. The restaurant has excellent deserts that I ordered and took back to my room for the family however we did not eat a meal there though the menu does look very good. The room was only half done on check in. One clean towel, used soap in the shower and dirty glass in the sink. Room was old. Service was ok and the restaurant offered good food. Location was great. Not great value for money during peak season. View was lovely from one of our rooms. Check in time was 1pm. We arrived at approximately 3pm to find our rooms dirty and not made up. Management were full of excuses about a staff member calling in sick, but no apologies or advised our rooms were not ready. Huge communication issue between reception and the house keeping staff. We were not the only rooms not ready there were at least 3 others on our floor of about 10 rooms. Solid place. Great views. Good food. Good location 2 blocks from the beach & lighthouse. My room had nice view of lighthouse. Nice receptionist, decent bed & Wi-Fi. Quite dated, small bathroom. Elevator was decent. This is a great little Motel. Our room was 306 and it is on top floor with outstanding views of the harbour. It is value for your money. Yes its a little outdated and could do with a lick of paint and new aircon but its still really good considering its position. We will be going back. The room was clean and comfortable. I slept well on a comfortable bed. Anyone taller than 183 might have problems though. The view this morning as the sun rose was priceless. This hotel was ok, decor is very dated but it is located close to the water. Free parking and Wi-Fi, which was good quality Wi-Fi. Rooms have microwave, kettle, toasted and sink. Air conditioning units are in the room, a little noisy and very old so you have to control the temperature by turning it in and off. Each room has a balcony. Good affordable accomodation. If you don't need the latest luxuries then this is a great place. Comfortable and clean rooms, very close to the waterfront and the cbd, friendly staff, late checkout no problems. Would return. Staff, especially one receptionist, is not friendly and rude over the telephone. I called on Thursday 29 December 2016 asking when is the best day to cancel (my father was admitted to hospital), she said before 48 hours, SHE DID NOT MENTION ANYTHING ABOUT PAYMENT. Then, I called on Saturday 31 December 2016 to cancel, because my was admitted to hospital, she said, you have to pay for one night. I was trying to explain to her, but she was so rude, saying, I have people in front of the desk, you have to decide and you have to be quick. I had to say yes, we're coming over for 1 night, thinking since we are paying. Mind you we had to pay $185. 00 for 1 night (no breakfast, just for the room). THAT IS THE BIGGEST RIP OFF, because when I called the first time, she did not say anything about payment and said THERE ARE ALOT OF PEOPLE ARE QUEUED UP. this is absolutely wrong and there is no compassion anymore, no understanding. I am pissed off, because she changed the story and made us pay for something, we shouldn't have. The funny part was when we checked in; another receptionist dealt with us and said you are here for 7 nights. I was really surprised and upset, after all that; the other receptionist did not even have the decency to cancel the booking. WHAT SORT OF WORK ETHICS IS THIS? This is NOT right and should've never happened. Rooms look and feel quite old although everything was clean. Had sufficient amenities. Older room but had been refurbished. Comfortable and clean. Nice bathroom. Staff friendly. Good location. Although the rooms are kinda outdated, they are clean and all the staff are very friendly. The restaurant has a great breakfast also. Good value accommodation. Rooms are clean & beds comfortable but there are absolutely NO disabled facilitis, not even a parking space. Isn't this a form of discrimination? Towel hooks over bathroom doors were too high to reach, unless you are very tall & fully able, towels were folded & left on window ledge behind the toilet so hard to reach. Cleaners left large laundry bags at lift door & one had fallen across lift door, which made manouvering a 91 yr old with a walker very difficult when leaving. Views & location were excellent. Smoking allowed on balconies which meant smoke wafted from adjoining rooms. Surely one room could be updated with shower bars & a ramp could be provided at the entrance were a step is very disepective for visually impaired guests. Helpful and friendly. Rooms clean but a little dated. Beds comfortable. A good location right next to the ocean. Good location. The room was decent. Nothing bad in my time staying there. The hotel restaurant was nice as well. Friendly helpful staff. Perfect location, outlook from balcony across small park to the boat harbour is just beautiful. Restaurant has the loveliest outlook to boat harbour and is comfortable and cosy. Rooms are clean & tastefully decorated. Could easily stay here for much longer than just a night. Balconies are small but perfect for soaking in the view with a glass of wine. Not fancy but for the price and location a definite winner. My family and I have been staying there since I was little. Love it. Simple but brings back allot of good memories. The staff was kind, and the location is good. The facilities are old, but comfortable and clean. Rooms old and dated but very clean and comfortable. View from balcony is obstructed by trees. The restaurant is tired and needs a facelift and so does the menu. The food is just not fresh enough and failed to inspire us. We loved the balcony's view of the harbor. One child under 12 years is charged AU$ 20 per night when using existing beds. All children under 2 years are charged AU$ 10 per night for children's cots/cribs. All children under 12 years are charged AU$ 20 per night for extra beds. All further older children or adults are charged AU$ 20 per night for extra beds.